C.F. Martin & Company is one of the oldest and most respected acoustic guitar manufacturers in the world, with their Dreadnought being the most copied. Established in 1833 they produce high quality steel string acoustics; Martin’s instruments have been played by everyone from Elvis Presley to Coldplay. Their designs past and present have had a massive influence on virtually every other acoustic guitar maker in existence. In many ways the illustrious history of Martin Guitars is the history of the acoustic guitar as we know it today. An early innovator in design and shape they can lay claim to two advancements that revolutionised the acoustic guitar market forever; the use of X bracing and the Dreadnought. First developed in the mid 1850s X-Bracing facilitated the progression from gut strung instruments into steel strung as it provided the strength and stability required to prevent the increased string tension from pulling the guitar apart while still allowing the guitar’s top to resonate freely. Although first used nearly 150 years ago, X-Bracing has never been bettered and is still used around the world today for entry level instruments as well as top of the range handmade custom pieces. The Dreadnought is the most popular and copied shape of acoustic guitar of all time. First launched in the early 1900s and named after a British battleship, the Dreadnought has become the staple core of acoustic guitars. It could be said that the Dreadnought has been the driving force behind every genre of popular music. Be it rock’n’roll, country, rag-time or bluegrass, the dreadnought’s bass-rich tonal clout and punch has made it a favourite with musicians all over the world. Its influence is such that virtually every luthier, workshop and manufacturer in existence that produces acoustic guitars offers a Dreadnought shape – such is the enduring appeal of Martin’s original design more than 100 years ago. The company’s headquarters and primary factory are in Pennsylvania and they also manufacture instruments in Mexico. During the year 1900, Martin produced 182 instruments. By the year 2000 that figure had risen to 24,085. In 1979, Martin opened its “Custom Shop” division. Martin built its 500,000th guitar in 1990, and in 2004 they built their millionth guitar. 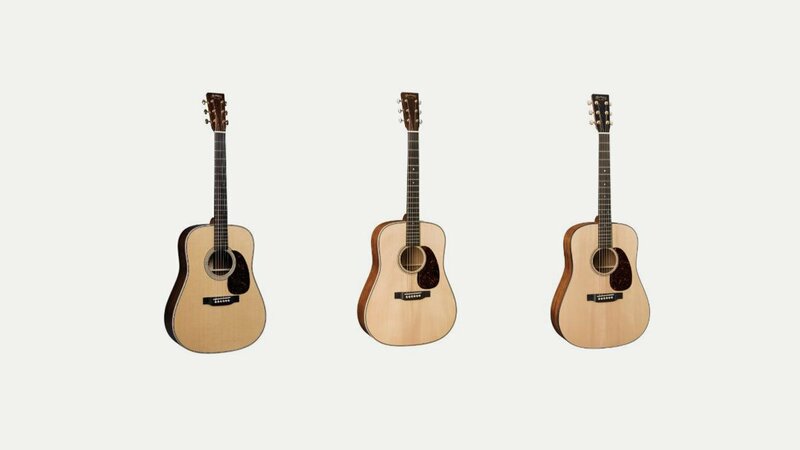 Martin’s current range encompasses more than 120 instruments for all budgets and musical tastes.